The Shoe-Sizer is a foot measuring device that we ship to you in order to get a consistent way of measuring your feet. This allows us to make sure that we ship you the correct shoes for your feet. 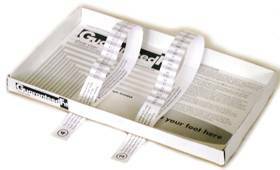 We ship the Shoe-Sizer with complete instructions for measuring your feet in a precise and consistent way. It's that easy. We take over from there. We use your measurements to send you the correct shoes for yor feet. When you place your order just pick "Use My Shoe-Sizer" when choosing the shoe size.